The most enigmatic person on the PGA Tour is Bubba Watson. No one denies his considerable skills with golf clubs. Who can forget the hooked pitching wedge from deep in the pine straw in a playoff on the 10th hole at Augusta National in winning the 2012 Masters—his first major. There is a flip side to that coin too. He can also be flighty, mercurial and sometimes completely detached from the moment at-hand. In winning last week’s WGC-HSBC Champions event in Shanghai the Bubba act showed legs in winning a significant event internationally for the first time and quite possibly providing a road map for what lies ahead in 2015. The win propelled Watson to his highest world ranking—3rd—the highest among all American players behind only the likes of Rory McIlroy and Adam Scott. Bubba, until his victory in China, had previously demonstrated little belief his considerable talents would come to the fore when leaving American soil. His Ryder Cup performance this past September at Gleneagles was simply abysmal—playing three matches with zero points earned. Watson has played in three Ryder Cups and in each he has also never won a singles match. Watching his demeanor in Scotland was watching someone who wished he could have been some place else. Golf is littered with players who have displayed an incredible possession of pure talent. Among contemporary names, Tom Weiskopf, Greg Norman, Fred Couples, Davis Love III, John Daly—to name just a few—have each provided clear episodes of vintage top caliber play. But none of the aforementioned could shake the tagline of underachiever as their careers stalled through a range of issues. Innate talent took them high into the pecking order, but only for so long and often times produced head scratching bewilderment on the lack of sustainability for what might have been. Bubba’s 2012 win at Augusta seemed to be a springboard for being among the very elite of world class players. What followed in 2013 was a complete drop-off from the radar screen. No wins in 21 events played and with only 3 top ten finishes. The 2014 PGA Tour campaign showed a different Watson—winning at Riviera in Los Angeles early in the season and then demonstrating total control for his second green jacket at Augusta in April by a three-stroke margin. But with Watson there’s never a dull moment. In 2011 he voiced rabbit ear complaints when playing in the French Open. Bubba’s demeanor in handling various crowd situations showed the disposition of a spoiled American incapable in adjusting as need be. In 2013 during The Travelers event in Hartford, Watson went off on his caddie Ted Scott because of what he believed was incorrect yardages leading him to make a triple-bogey at a critical point in the event. With Watson, the various grimaces and face-twitching can have his head spinning in all sorts of directions, should something unforeseen take place when he’s playing. On the flip side he has the wherewithal to shape shots as need be—to power tee shots easily in excess of 300 yards—and demonstrates a fearless side in posting low numbers when other players have struggled. Despite his physical capability the mental side is the dimension that Bubba will need to harness. During his peak time as player, Jack Nicklaus candidly said certain players swung the club better than he but they often made faulty mental errors in knowing what club to play and what shot to attempt at critical moments. The Golden Bear was the consummate tactician—rarely beating himself down the stretch of a big time event. What’s in store for 2015? Hard to say. Will it be Bubba boy or Watson man? The former is regression—the latter progression. Bubba Watson can be everything and more in golf but the mental side is central to being more consistent—more in the mix on a regular basis. Does Bubba have the desire to push beyond what his talents have provided him to date? That’s hard to say with certainty. The win in Shanghai could well prove to be the catalyst to show clearly how he has matured—how he can play world class consistent golf and push the likes of McIlroy, Scott and whoever else is amongst the top of the pecking order. 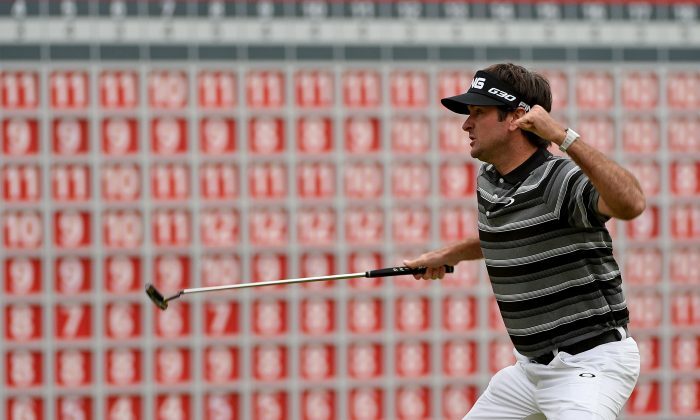 Bubba’s swing is the home made variety—no teaching gurus and entourage hovering around him. The golf world knows he can win at Augusta. Can he do what he did in China at other key events? This next yera will show whether there’s another gear for this talented lefthander. But getting his head in line with his physical skills will once and for all lay to rest the constant battle for golf’s version of Dr Jekyll and Mr. Hyde.